We all ask at some point, why is this beautiful rabbit called a hare? Believe it or not, there are actually several differences between a rabbit and a hare. Physically the hare has longer ears and hind legs. In general, the hare is just overall larger than a rabbit. They also have different lifestyles. The hare is a solitary animal while the rabbit enjoys living in groups. The hare just makes a slight hole on top of the ground to sleep, while the wild rabbit prefers a burrow below ground. 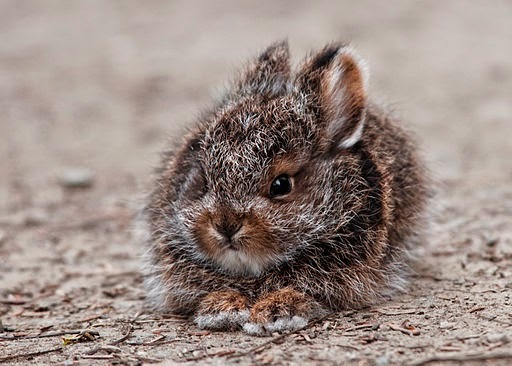 At birth, the hare is fully furred, has his eyes open and will hop within moments of being born. A baby rabbit is hairless and blind. It must adjust to this new world before it is ready to "hop around." Like the Arctic Fox, the gorgeous fur on this hare changes color with the seasons. In winter, the fur is white to match the snow. In summer, the fur turns brown and serves as a marvelous camouflage in nature. Just look how well he blends in on the picture. 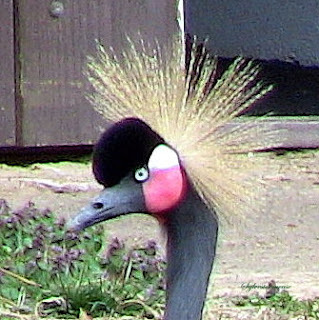 You would probably completely overlook him in the wild. When the hare hears a noise, he remains perfectly still. 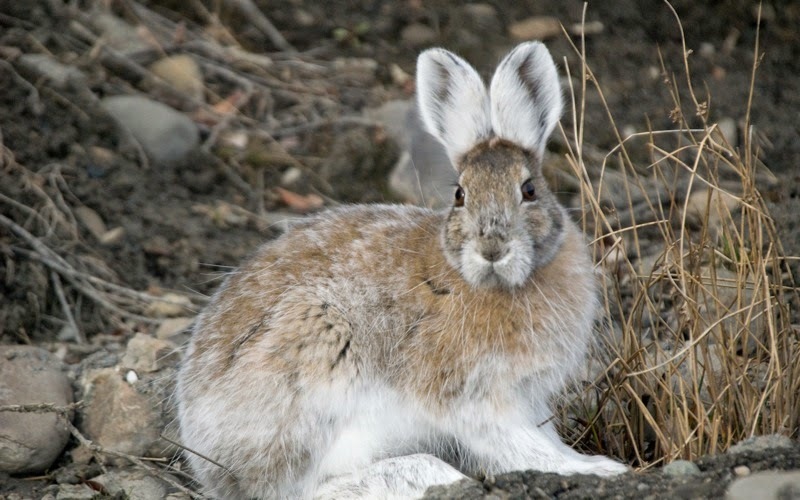 The Snowshoe Hare also has fur on his feet to protect him from the freezing ground and I Personally think his black tipped ears are absolutely adorable. 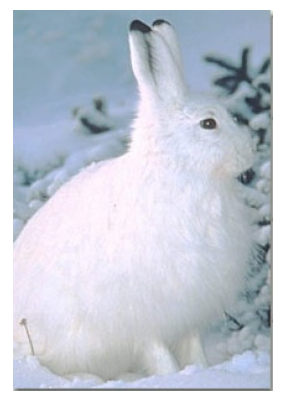 He is called a Snowshoe Hare because of the tracks his large feet leave in the snow. His toes can be spread out for balance and the wide toe and slender heel track resembles a snowshoe impression. In addition to his leaping abilities, the Snowshoe Hare has remarkable running and swimming skills. Thus, he is often able to avoid capture by a predator. Weight: 2 - 4 lbs. Bring home your own Snowshoe Hare! You can learn more about the Snowshoe Hare with the book, play a game or snuggle with your won precious and beautiful Snowshoe Hare. Any or all of these items would be awesome. I'm not likely to see this hare where I live, since we have no snow. We do have a few hares that live in the riverbed or near the river. The first time I saw one loping along the riverbed from a distance, I thought there might actually be some truth to the old jackalope legend. It was a long time before I could get close enough to see it was just a large hare.